I was able to pick up a copy of Robert Nathan’s Portrait of Jennie and start reading it. This was a new-ish edition brought out by a publisher called Tachyon Publishing. Sean Stewart wrote the introduction, and in it he talks about how the artist’s job (or compulsion) is to bear witness. I thought about that. If I were to sum up my own compulsion, it would be to recover. I always want to bring back what was lost or forgotten. 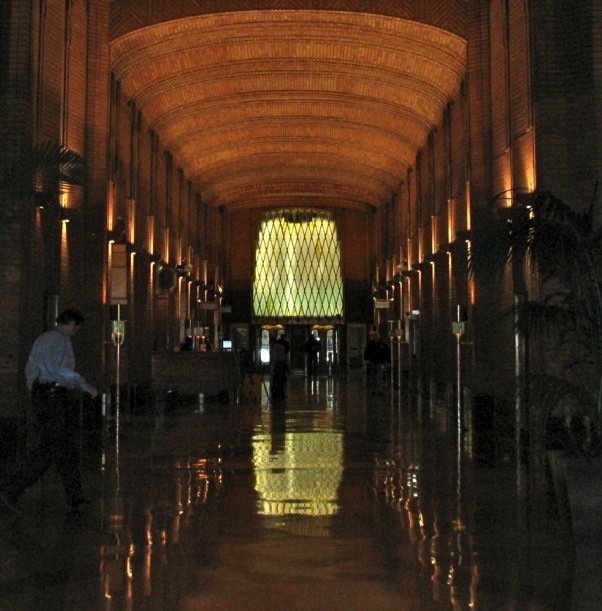 The lobby of the former Western Union building. “Lost or forgotten”. Boy can I relate. Lives buried in anonymous paper, it’s like you’re digging somebody out from earthquake rubble. The feeling of urgency, like you’re saving a life. You always have such beautiful pictures. I assume that you are feeling better – at least I hope so! Enjoy this beautiful weather! Thank you! And I am much better. I haven’t been able to get out much, but today I plan to. I’s say that you were more of a Rescue Artist. I love that title!! Rescue Artist!